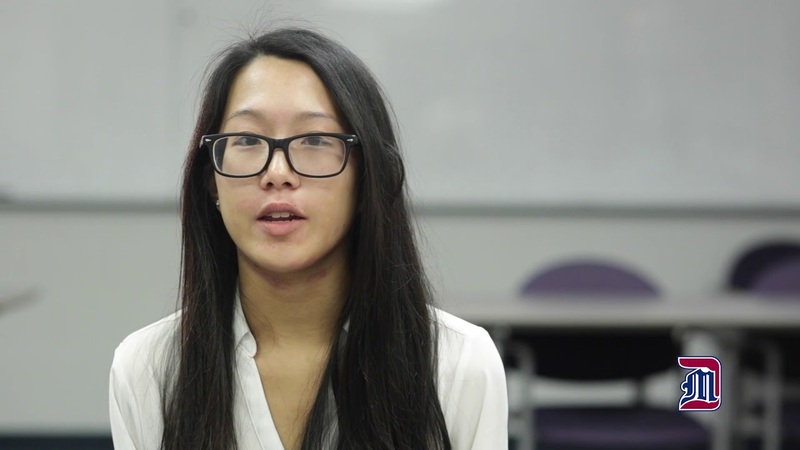 University of Detroit Mercy student Tiffany Tieu Ngo recently earned selection as one of only eight U.S. college students to serve as a student representative at the 2018 United Nations Framework Convention on Climate Change (COP24). Ngo, a Biochemistry major, will serve as a student representative for the American Chemical Society at the conference, which takes place in Katowice, Poland, from Dec. 3 to 14. She is the second Detroit Mercy student in as many years to earn this prestigious honor. In 2017, Justin Pothoof, a senior Chemistry major, attended COP23. Mark Benvenuto, professor and chair of Detroit Mercy’s Chemistry and Biochemistry programs, warned Ngo, while she was working on her application, that the process is highly competitive, and many talented students are not selected. Still, he encouraged her pursue the opportunity. “It’s important for students to give it a try,” he said. “We were really glad and humbled to have two students selected two years in a row. My job was really to give her the push to get the application done." Benvenuto said having good students, like Ngo, who excel academically and express a passion for the well-being of our environment, make teaching easy. “Tiffany is an outstanding young woman, who brings a great deal of passion to her studies and wants to use her academic training and experience to try and make a difference in the world,” he said. For Ngo, climate change is an important issue. Having the opportunity to attend this international conference empowers her to use her voice when discussing environmental issues. “Being selected is really quite wonderful because I personally believe that climate change is a big, big issue in our world today. I believe that going to this conference will shed some light on a lot of issues that big figure politicians and activists will talk about and the conference will expand my knowledge on that,” she said. Ngo is also not shy about the role of her professors have played in her intellectual development and how important they were in terms of receiving this opportunity. Benvenuto is eager to find out what Ngo will learn from her experience at COP24 in Poland. To view a video regarding Ngo's selection, visit https://www.youtube.com/watch?v=BTVU-p8YCtE. For more about Detroit Mercy’s Chemistry program, please visit http://eng-sci.udmercy.edu/index.php.